Fire Emblem: Awakening came out a little while ago and I’ve been trying to squeeze as much of it in as I can between Dead Space 3 and Ni no Kuni. There are several games in the series spanning multiple consoles but I’ve really only played the two games on Game Boy Advance. Fortunately it seems that you really don’t need any knowledge on the other games to understand what is going on and if you are at all interested in strategy/tactical RPGs then the game is a real must-buy. In the game you control several different units at a time, the amount depending on the level, and strategically move them around the map. On your turn you can move your units in any order you want and order them to attack hostile enemies. There are several different classes your characters can be such as cavalier, knight, cleric, thief, mage, etc and several more advanced classes that they can turn into. Each class can use different types of weapons such as axes, swords, and spears which makes a sort of rock-paper-scissors mechanic. Meanwhile classes like mages and clerics can only use magic tomes and staffs, respectively. Upon changing to more advanced classes characters might gain the ability to equip additional weapon types. The amount of setups you can get with different character and class combinations is ridiculous and offers a good amount of replayability. Another important aspect of the game is the relationship system. I don’t know if it has a specific name other than that. Relationships have been in other Fire Emblem games but they’re especially important in this one. Not only do your units gain statistical bonuses for fighting next to people they have a strong relationship with. You can actually pair off and marry different characters together who then pass on their stat bonuses and special abilities to their kids, creating an even more powerful generation of units to battle with. This again adds to the games replayability as you can match almost any male and female together. It can actually be a pretty complicated system if you really want to min/max. Visually speaking the game is top-notch. Easily one of the better looking 3DS games available and the 3D effect is actually well done. The level maps are in 3D but the characters are 2D sprites. It kind of creates a neat combination of new and old. When your units engage in battle the screen switches views down to the fight between units and you get to watch them beat on each other. You can even pick the viewing angle of the battle, including a first person perspective. It’s pretty awesome. The game has a pretty lengthy campaign and additionally Nintendo releases free content via spotpass along with offering some DLC maps you can buy. This coupled with all the different characters you can recruit, their class combinations and relationships really provides you with a lot of bang for your buck. Oh, and I didn’t even mention the multiple difficulty modes you can choose and the option of playing on casual mode or classic, which determines whether your units can come back or die forever. There’s a lot to experience with this game and it’s really only the beginning of the awesome games avalanche that is hurtling this way on 3DS. With Castlevania, Luigi’s Mansion, Pokemon Mystery Dungeon, and Monster Hunter on the horizon you’d better play this game while you still have the time. Next PostBack off, man. I’m a plumber. I may have to borrow my daughter’s 3DS and get FEA. It makes me wish I didn’t sell my 3DS. Looks awesome, great write-up Graev. I’ve been enjoying this game, as well. Picked up a 3DS XL for the Pokemon coming out later this year and decided to get Fire Emblem to start things off. I only know one other friend with a 3DS, but I expect that to change this year with things like Pokemon and Animal Crossing coming out for the system. Sounds very interesting, but I do not own a 3ds. Maybe if the next pokemon turns out great… ill get one. 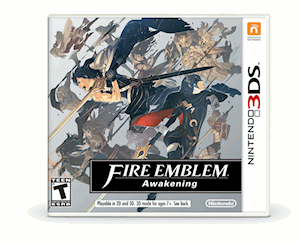 I ended up getting the 3ds bundle with it preinstalled just for this game as I have been a fan of the series for a long time to the point of actually finding translated roms of the older games that never got imported (which are fire emblems 2-6, with awakening as 13, the old gba ones being 7 and 8). I have been having a lot of fun and already have 3 save files none of which have beat the game yet, one being a hard classic run where I’ve been grinding on some of the spotpass/dlc maps and grinding out s rank relationships just so i can get all the children side quests so basically my completion file, then another hard classic where I don’t grind (grinding for even an hour or two on the free DLC map makes hard pretty easy even) for the challenge, and then me and a couple friend started a lunatic race run to see who can finish it the fastest on lunatic… which is really hard. I’ve been loving it though and it is definitely one of the best fire emblem games, and one of the best handheld games I’ve played in a long time.